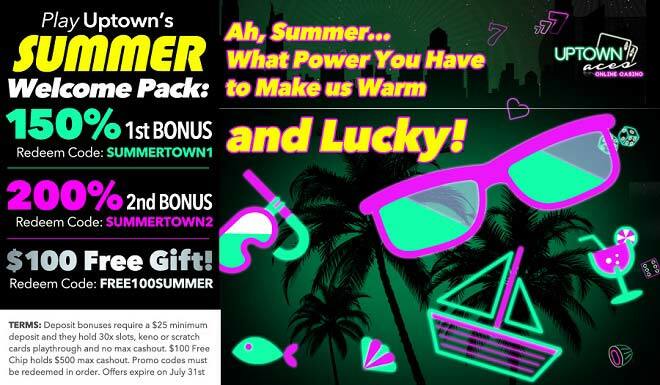 Kickoff Summer Uptown-Style + $100 Free Bonus! Summer has officially arrived and all season long (and beyond) we’d like you for you to spend it Uptown! Kick off this fun time of the year by diving in a pool of wins and enjoying our most prestigious summer kickoff celebration: Deposit as low as $25 and you’ll be greeting the sunny days ahead with two massive bonuses and a $100 Free Gift! Get your shore-side inspiration right from the top of this brand new season and spend July filling your Uptown account with wins when redeeming a 1st 150% Match, a 2nd 200% Bonus and a $100 Free Gift! Spend your oh so awaited sun-seeking days Uptown and watch how the temperature and your winning chances rise hand in hand!